A very enjoyable event held in the Walks in King’s Lynn for the Lions. John, Frank, Leon and Alan were on parade. 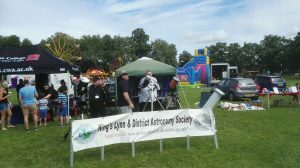 We had a lot of visitors using the telescopes and looking at the photos on the display boards in the gazebo. Are you new to Astronomy?